Occupation: What ever Im doing at the time. Trained in philosophy and as a veterinary technician, currently working for United Outdoors Stores. Also sell a line of skijor belts and harnesses from Free Spirit Outfitters and Tiaga Mushing Supplies. 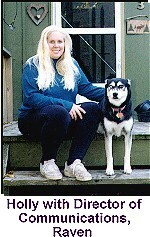 Member of North Star Sled Dog Club, ISDRA, and Wisconsin Trailblazers. Currently living with reluctant kennel partner Holly Frye and specializing in skijor class competitions. Current kennel size is seven, two Siberians, four Alaskans, and one Orange Tabby Cat with a neurological deficit. My race team is normally made up of three Alaskans, but I added a leggy Siberian to the team this last winter as an alternate and had good luck. The other two dogs are retired and are being cared for by the cat. This all started when my mother wouldnt let me have a Husky. She claimed they didnt make good family dogs. That caused me grow up with a toy poodle named "Jaque" that had a Napoleon complex and attacked everyone in site. He used to ambush me from under the couch. A childhood like that causes the trauma that creates the right mindset to become a musher. Just about seven years ago I met Liz Deye and her daughter, Jennifer, from Jedeye Kennels in Cambridge, Minnesota. They had a female Siberian that they wanted to place and Holly and I wanted a dog. Getting a dog from Liz is like interviewing for a job, so we spent a fair amount of time with her, including a trip to Cannon Falls to see a race. It was there that I saw a skijor race for the first time. Back then not many people were using more than two dogs and many were only using one. I figured I was a pretty competent skier, I had a new sled dog and the rest, as they say, is history. That dog took me to dead last on the first day of my first race and never even finished on the second. We immediately changed her name from "Raven" to "Potato" and retired her. Her role as director of communications still makes her a valuable asset. 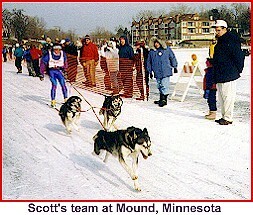 Later that season we acquired two more Alaskans and started to have some success in our training and racing. As time went on we have added to the kennel to get up to its current size. We have tried very hard to grow this kennel in a very controlled way and work hard with the talent we have. My teams have rewarded us with two golds and a silver medal in the North Star Sled Dog Club Pro-Skijor Class. We may have done even better, but with some injuries, missed races, and bad snow years, things dont always turn out as planned. But that is, in fact, what makes this competition so interestingon any given day something unexpected can happen. As I said currently we have six dogs, four that are actively being trained to race. I dont breed dogs because we want to keep the kennel small. To start an in-house breeding program would require a lot more dogs and time to achieve the desired results. I also believe there is an awful lot of dog talent out there that doesnt get utilized. They kind of fall through the cracks with the larger kennels. Well always be able to produce more dogs than we could ever use. In addition, dogs that have been with larger teams and just dont make it any more due to any number of factors, can thrive in the relative low stress of the smaller skijor team. A great example is my dog "Ruby" who moved from a distance team to a Junior sprint team and then to my skijor team, winning three North Star gold medals in the process. I believe her running days were doubled by that progression of events. Not to mention she taught me more about this sport than any other single living being. Give us an overview of your feeding program? Our diet is almost exclusively a premium commercial diet. This year Pro-Pac dog food is our sponsor. I think its important to let small kennels like mine know that feeding doesnt have to be Beaver carcasses and walk-in freezers. I contend that performance animals can be fed commercial dry feed, with some supplementation and thrive. However, I will do whatever it takes to keep my dogs healthy and performing, so if that includes fresh meat, so be it. However up to this point I havent had to do much of that. Summarize your basic management style. I live in a suburban area so my dogs are close to my house and almost as close to my neighbors. They are on 10 foot cables and for housing we use plastic barrels. I have all the dogs in areas with overhanging trees so no one has to be in the sun if they dont want to be. Being this close to neighbors, and pushing the envelope as to my number of dogs, I try to keep the area meticulously clean. Ive been known to scoop up to four times a day and am always filling in holes. Heat is the thing I most worry about. I water them with K9-Bluelite when it gets extremely hot. One old retired dog has a big galvanized wash tub that I fill with water and she goes and sits in it when things really heat up. I never worry about them when its cold. The other thing about being within spitting distance of your neighbors back fence is that we try to be an attraction in the neighborhood. People are encouraged to visit and ask questions about the dogs. We try to invite everyone to races by handing out North Star schedules and have given rides around the streets after big snowstorms. It goes without saying that the dogs need to be socialized and encouraged to interact with strangers, particularly curious children. I start training as soon as the weather cooperates in the fall. 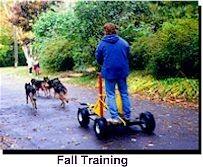 I used to use a mountain bike but have since purchased a "Sand Lynx" training cart. Its a perfect size for small teams and loads and unloads from the top of the dog trailer easily. I start very slow and develop a foundation for the longer runs to come. It takes a lot of time and is really not very interesting at that point. It is, however, critical not to minimize these short runs. They are like the review we all got in school after summer vacation was over. It sets the tone with the dogs for the rest of the season and will help prevent lots of problems later. After the snow flies I start working them using a sled. It may surprise some people to find out that I seldom ski behind my team until race day. The sled offers me more control over the team should I need to correct something and more safety for me on marginal training trails. Its one thing to take out one dog, but when its time to take out all three, its no fun to be on a trail in marginal conditions and on skis. Once the team is in shape, I alternate between 6 and 12 mile runs. I use the 6 milers for speed and the 12s for endurance. That may be longer than most people train for a 4.5 mile sprint, but I think the team has fun on the longer runs and they get a chance to settle in. I also get a better look at them after they slow their pace a bit. 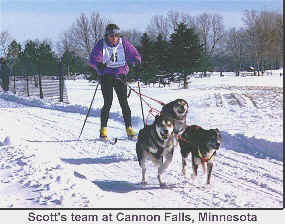 Last year before the first race in Iron River, Wisconsin, the dogs had about 300 miles of combined cart and snow training. I would be remiss if I didnt include something about my training as a skier. Because I try to be a very active part of the teams effort, I feel that I need to train as hard as they do. This involves roller skiing, running, and biking in the off season, with weight training year round. But when the snow flies I try to get on skis as much as possible. I think the team is hurt when youre not smooth on your boards. When I hook up to three adrenaline crazed dogs on race day, its no time to be feeling even a little uncomfortable on my skis. 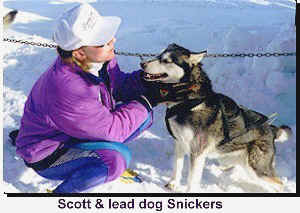 What advice do you have for the beginning Musher/Skijorer? Know what youre getting into. This is a sport that can be done with the household pet and thats what makes this the fastest growing segment of sled dog sports. But realize that even a single dog is a big commitment and when you start making housing decision based on the number of animals you own, your life no longer is your own. Start slowly. If you are trying to get "Bowser The Beer Dog" to pull you around on skis, know that this dog may not be in that great shape. Let the dog work into condition slowly, and make sure before you try your first race that the dog has adequate training miles. The dog could be soured, hurt, or worse. Know your limits. Ive always said that in competitive skijor there were two types of teams: those with good dogs and marginal skiers, and those with marginal dogs and good skiers. This is changing, however, and soon great dogs will be paired with great skiers and it will be time for me to get out. But the point is that if your skiing ability is remedial and you hook yourself to a couple of supercharged racing hounds, you may just hurt yourself, the dogs or both. Match your dogs to your ability. My rule of thumb for gauging whether or not someone is over dogged is: if you have to think more about your skiing than about your team, you are probably going too fast. Finally have fun! Many times I have gone into a starting chute at a North Star Race with fire in my eyes and that competitive game face on. It has never failed that another competitor will turn to me and say "HAVE FUN!" Its seldom the same person twice and it never fails to bring into the focus the reason Im out there. Thats the spirit of all the mushers Ive met, in particular those of North Star. I would encourage people thinking about getting involved to do so because there is a mentor to be found near every dog truck. What is the future of skijoring? I think skijoring is the great equalizer. By that I mean it lets small kennels like myself become competitive and allows others to dabble in the sport. I think it also is a great image builder for mushing overall. 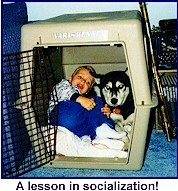 It allows the so called "outsider" in, and lets them feel what its like to work with their animal. This understanding by more people can only lead to more understanding about the other facets of our sport. On the event side I think we will see expanded venues for skijoring. I hope to see some longer races in the 20 to 40 mile category. These could be run in conjunction with other distance events. Also I think you will see local park access with designated skijor trails and informal skijor competitions where the race might only be one day and the prize is in the participation. I also think that ski shops and ski companies will get involved and maybe aid in product development of skijor equipment. Any comments on plans for the future? This winter Im going do a lot of the same things as last winter. Try to concentrate a little more on the longer distances and get myself in better shape. I also would like to do more teaching of the sport, both on the ski side and the dog side. I may cut back my racing some but that remains to be seen. Ill be 42 in July and last winter I was beat out for the gold by a high school kid from Bemidji, Minnesota. Maybe the handwriting is on the wall.